This plant blooms like clockwork. Romans, following the Greeks’ lead, gave it the name calendula, meaning little calendar or little clock, because they noted that it flowered on the first days of the month. And it can even bloom late into the season. My calendula shows little sign of slowing down, though its neighboring annuals have blackened from the slight frost we had last week. 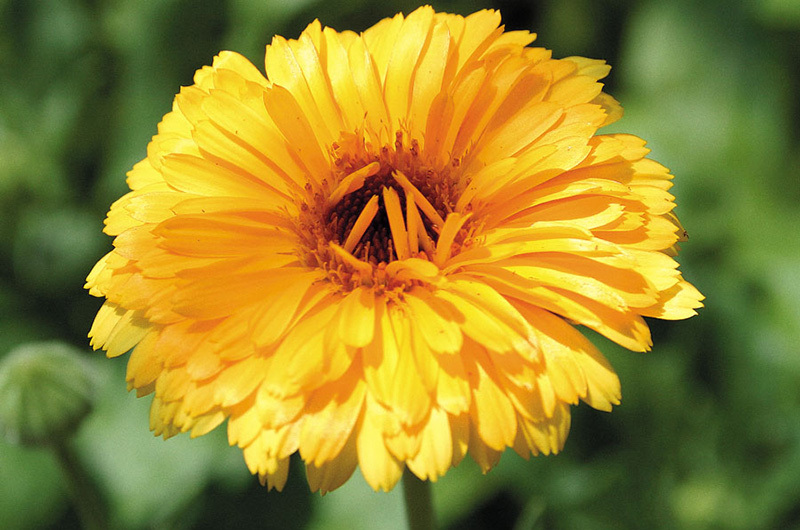 In The Book of Herbs, Rosalind Northcut cites calendula for its “indomitable courage, which with, after even a sharp frost, lifts up its hanging head, and shows a cheerful countenance.” It should be mentioned, too, that calendula is relatively low-maintenance and easy to grow. You’ll notice that Shakespeare and Keats use the name marigold, which seems curious to us because most of us think of the seasonally popular container marigold, from the genus Tagete. However, flowers of the genus calendula are also called marigolds. Plants of the former hail from North, Central, and South America, while those of the latter are of European and Asian descent. Both do share characteristics and a family name, Asteraceae, which includes asters, daisies and sunflowers, among many others. and was used in Catholic events and in other religions and cultures. Considered sacred in India, marigolds are used to decorate statues of Hindu deities. Romans and Greeks sported crowns or garlands of this flower ceremoniously. While widely revered in spiritual circles, common folk also hold calendula in very high regard. Its uses and benefits seem endless and are so inclusive it is hard not to consider this plant a cure-all and do-all. For home and hearth, one could start with its culinary uses. The flower’s petals and leaves are edible. Various parts can either be pickled or used fresh in salads, for making tea or wine, as a replacement for saffron, to color cheese and butter, in pudding or as a potherb in soups and stews. Obviously, it’s as versatile as any herb you can think of! Another of its aliases, pot marigold, underscores its culinary commonness as a potherb. Add to this its use as a dye (yielding yellow, brown or orange), insecticide, hair lightener and even weather forecaster (the flower closes when wet weather is coming) and it is hard to believe that any home is without it. For health, calendula is unmatched. It seems almost every ailment can benefit from an infusion, tea, tincture, ointment or poultice of this persistent perennial. Skin treatments made from it alleviate cuts, burns and acne. During the Civil War and World War I, it was employed on the battlefield to staunch bleeding, prevent infection and speed healing. Internally, it is claimed to be beneficial for inflammation, as an anti-tumor treatment and for cramps and constipation. Naturalist Nicholas Culpepper’s advice can be taken to heart since he claimed it strengthens that organ “exceedingly.” The only condition, apparently, it is not recommended for is pregnancy. Today, even in November, we can note–as the ancients did–that there are few plants so fresh, refreshing and even daily refreshed as this dependable daisy. Suzan Bellincampi is director of the Felix Neck Wildlife Sanctuary in Edgartown, and author of Martha’s Vineyard: A Field Guide to Island Nature. No one likes to be stranded. Australian novelist Richard Flanagan takes a benevolent view of immigration. Last week, things went from bad to worse.